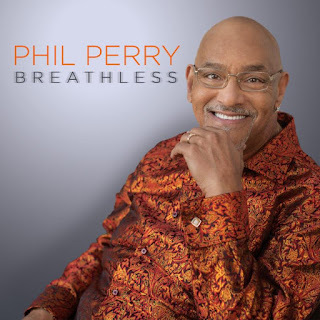 JAZZ CHILL : PHIL PERRY RELEASES HIS 12TH SOLO ALBUM "BREATHLESS"
PHIL PERRY RELEASES HIS 12TH SOLO ALBUM "BREATHLESS"
JazzTimes Magazine once declared that Perry "creates joyous, romantic magic." Phil Perry's rich smooth tenor and unrivaled falsetto have set him in a class by himself. For Perry, who has been dubbed the "real deal" by the iconic Al Jarreau, his unique voice and approach to the music are simple. "I try to always be me...I just sing. What comes out is what comes out. It's just Me." Phil Perry's new album, his 12th as a leader, Breathless, will leave you feeling just that. The singer explains, "Each of my 12 solo projects is a House where listeners go to HEAR the music, but while they are in there they also FEEL a lot of love - it's Home Sweet Home." Perry is joined on Breathless by his longtime collaborator, producer extraordinaire and pianist, Chris "Big Dog" Davis. Davis and Perry have a chemistry in the studio that is undeniable. Having worked together on several projects, they have proven to be a winning combination. "Chris and I respect the music the same way we respect each other," shares Perry. It's a unique and rare thing and it's easy because we speak the same language. What's really amazing are the times we enjoy whenever we get the chance to perform LIVE together." Breathless features such gems as the timeless title track, the tender ballad "Never Can Say Goodbye," Perry's stunning recreation of Stevie Wonder's timeless classic "Love's In Need Of Love Today, " a delightful in reinvention of the Burt Bacharach/Hal David composition, "One Less Bell To Answer" and more! For over four decades Phil Perry has provided the soundtrack for generations of fans. In the mid-1970s, Perry came to fame as a member of the revered soul group, The Montclairs, and subsequently as part of the duo Perry and Sanlin. The dynamic vocalist launched his solo career in 1991 with The Heart Of A Man, which featured an impressive re-make of Aretha Franklin's "Call Me" which hit #1 on the R&B charts. Pure Pleasure came in 1994 and yielded another hit with his version of "If Only You Knew" and an unforgettable version of the Spinners' classic, "Love Don't Love Nobody." The highly versatile Perry also began achieving success in the contemporary jazz arena through his collaborations with Lee Ritenour, The Rippingtons and numerous others. One Heart One Love came in 1998 and hit Top Five on the Billboard Contemporary Jazz chart. Book Of Love and Magic followed and in 2006 Perry released Classic Love Songs, reminding audiences once again of his unmatched ability to put his own signature stamp on well known hits. Next came A Mighty Love in 2007, followed by Ready for Love and the stellar collaboration with Melba Moore, The Gift Of Love in 2009. Say Yes was released in 2013 and included imaginative and brilliant re-workings of such love songs as Sam Cooke's "You Send Me" and Simon and Garfunkel's "Bridge Over Troubled Water." It also featured a stirring duet of "Where Is The Love" with Chanté Moore that garnered considerable attention at radio and is listed on Billboards 2014 'Top 50 Smooth Jazz' songs. 2015 saw the release of A Better Man which among other gems featured two definitive re-workings of the Curtis Mayfield classics "Gypsy Woman" and "I'm So Proud."